Rent a Fetal Doppler Heart Monitor from Heartbeats At Home " America"s Premier Fetal Doppler Rental Company "
FREE SHIPPING & FREE RETURNS on every order + the LOWEST PRICES we've ever offered. Please note, our high quality fetal dopplers are made in the USA and are regulated by the FDA, requiring stringent quality control standards. Welcome to Heartbeats At Home and congratulations on your pregnancy! For over 16 years, we have offered caring customer service and the best doppler products at the best prices anywhere. As a Christian owned company, we also pray for you and your baby. Our Customer Testimonials below speak for themselves! Read them and discover why Heartbeats At Home is considered to be America's Premier Fetal Doppler Rental Company. At Heartbeats At Home, we believe that each pregnancy is a miracle and every baby is truly a gift from God. With that in mind, trust that we care about you and your unborn baby. We are a family-run business providing Fetal Heart Dopplers to expecting moms all over the USA & Canada. We not only follow FDA regulations and sterilize our Fetal Dopplers, we also pray for each of our customers and their babies. Heartbeats At Home rents ultrasound equipped Fetal Doppler systems (also known as Fetal Heart Ultrasound Monitors) to expecting moms as early as 8 weeks into pregnancy. Our Fetal Heart Monitors are simply the best way to gain the assurance and peace of mind every pregnant women desires, especially during a high-risk pregnancy. The advanced ultrasound technology built into our Home Fetal Doppler Systems has been used by thousands of OB"s for over 30 years and has been FDA approved for safe use in the comfort of your own home. "I wanted to thank the owners of the company for providing such an amazing service. I only wish I knew about this sooner. I would have loved to have had one for my two previous pregnancies. The package arrived a day in advance and we could hardly wait to use it. The instruction packet was very helpful, and we like that the volume can be adjusted with your thumb while holding the monitor. We look forward to trying to record the heart beat. It has been a relief having this since there was a bit of difficulty finding my baby's heart beat at my last appointment. We have been reading books and showing ultrasound pictures to our two youngest to try to let them know mommy has a baby in her tummy. They were amazed when they actually got to hear the heart beat. Now my son asks when we are going to bring his baby home. Thanks again for offering a product like this for mothers-to-be. It has been a relief for those with a difficult pregnancy, and those who want to be able to hear their little ones." "I just want to say what a lifesaver this little device has been. We've had four previous miscarriages and this pregnancy had unexplained bleeding throughout. Checking the heartbeat has saved so much stress. I told my husband I would give up my car to have this!" "I originally was online trying to find a quality doppler that was affordable yet easy to rent. I ran into some feedback online where a lady had rented the same doppler I received and was overjoyed with your product. What really caught my eye was the fact that you guys really really CARED. After visiting your website I felt that you truly had a deep understanding of how important it was to have your little ones heartbeat at just a click of a button. I thank you so much and am enjoying this doppler. I heard the heartbeat and tears of joy streamed down my face. I thank you so much for being so understanding and providing us new mommies out there with a company that has old fashioned values!!" "We have absolutely LOVED having it and being able to listen to our little baby morning and night. It has given us considerable comfort and we are grateful. Many thanks." "We went through over 3 years of fertility treatments. I had 6 miscarriages. During my last pregnancy I had so many complications that I spent most of my pregnancy on bedrest. I spent my pregnancy waiting to lose my baby. In my mind it was not a question of "if" I would lose the baby, but "when" I would lose the baby. With the problems my pregnancy imposed even the most optimistic doctors sometimes had their doubts. My only salvation during the whole thing was the doppler I rented from you. Anytime I was afraid that something was wrong (which was all the time) I could grab it and check on the baby. I kept it on my nightstand so I could reach it whenever I felt the notion. I think I might have gone insane without it. It gave me a way to survive the wait between doctor visits. I could never explain how much that helped me. I used it every day until I was admitted into the hospital for the final months of my pregnancy. I didn't need it there because they monitored me around the clock. My beautiful baby boy was born 8/3/04. I cry when I look at him and remember listening to his heartbeat with your monitor. I remember the early kicks and hiccups I couldn't feel, but could hear with your monitor. Thank you for such a precious gift." "I want to thank you for your service as having the doppler here at home has given me peace of mind. I also wanted to add that I really appreciate the warmth & personal service you offer such as prayer requests etc... Your company is like no other and I wish you all the best." "Wow!!! I just received my fetal doppler. Within 5 mintues of the UPS truck pulling away I was listening to my baby's heartbeat! After losing three consecutive children, renting the doppler is a small price to pay for peace of mind! Thank you so much!" "I just wanted to follow-up and let you know how pleased I am with the doppler I rented from you! It has been such a pleasure and relief to be able to listen to my baby's heartbeat whenever I want. As a matter of fact, with your help and the information you sent, my husband and I were successful in making a recording of our baby's heartbeat. You were absolutely right about how easy it was to do. I have attached it to this email for your listening pleasure. :) Additionally, I have shared this not only with my family and friends, but also with several ladies in my office, some of which are also expecting - so don't be surprised if they contact you soon to also rent dopplers! Thank you again for all your help and God bless..."
- Susan and Darryl I. "My wife is 12 weeks pregnant with twins; this will be our 5th and 6th child so you would think we were comfortable with pregnancy and wouldn"t really bother with wanting to hear their heartbeat until the doctor"s visits, but because we are having twins and my wife"s age, we were worried about the pregnancy and I thought how nice it would be to have a Fetal Doppler like my wife"s doctor uses. That is when I found your website and ordered the Fetal Doppler to check the babies heartbeat for ourselves. The Doppler arrived today and my wife and I just used it an hour ago and I have to tell you, I was amazed. I couldn"t believe how clear the babies heartbeat was. We plan on using the Doppler every night. Thank you again for offering such a wonderful product which allows parents to listen to their baby"s heartbeat whenever they want." "Hi, Just received the doppler in the mail today. We heard the heartbeat for the very first time today after fearing a miscarriage. I was surprised that I was able to hear it so early "10 Weeks. I am so so so happy that I rented it and will keep it until the birthday! The best baby item I have gotten so far! THANKS!!!!!!" "Sending a note to tell you how comforting the fetal heartbeat monitor is! After ttc for 10 years, I probably am a little anxious and am so happy that this pregnancy is going so well. Every few days or so, I listen to the baby's heartbeat and am comforted knowing that everything is okay so far! Thanks for having such an important product at a reasonable price." "I used one of your dopplers from 16 weeks of pregnancy until I delivered at 41 weeks(!). Using the doppler daily was the most reassuring thing I could have done. Honestly, I don't think I would have had the relaxing pregnancy that I had were it not for your service. The equipment from your company was of a higher quality than the dopplers used at my OBGyn's office. Also, I got to the point where I could find the baby's heartbeat quicker than the nurses could at my doctor's office (the REAL heartbeat, not just blood moving through the placenta). I highly recommend renting a doppler for EVERY mom-to-be!! Modern technology is such a blessing." Both my wife and I are very excited and anxious to begin using the Doppler. Currently, we have a friend who's renting one and my wife had the opportunity to try it out. Wonderful!! She was able to hear the "pitter-patter" of our little baby's heart. Again, wonderful! Thank you again for the information as well as the service you provide!" "The doppler is so wonderful!! It is such a treat to listen to the baby anytime we want!!" "I had your doppler since the first trimester and kept it until I delivered my baby 6 weeks ago. I don't know what I would have done without. After suffering through 2 miscarriages that were only detected only after ultrasound, it was so reassuring to be able to quickly locate and hear my baby's heartbeat. I would highly recommend it." "This doppler gives me such a sense of relief and comfort. We use it every night to track our daughter's heartbeat and then again in the morning when we get up. We lost our first daughter to a cord accident. She was viable and if we had known she was in trouble we'd have had and emergency c-section. This little piece of equipment empowers us to feel like we can intervene should the situation arise. Thank you so much for offering this option to parents! What a great comfort and relief! Sincerely,"
"I'm very happy with my fetal doppler. We will probably keep it throughout the pregnancy. Thanks!" "This was the most exciting thing I have ever used. For me, a first time mother, I was very excited and so was my husband to actually hear my baby girl"s heartbeat from my very own home. I"ll be recommending this to all my friends and family when it"s their turn. God bless you all." "We received the doppler yesterday and we LOVE it. My husband was not able to make the OB visit last month, so last night was the first time he heard baby's heartbeat, which was great (and it's so easy to use)! Thank you for the bracelet as well." "I recieved my heartbeats at home just yesterday and my whole family loves it. We got two good clear heartbeats. We have had a complication with this pregnancy and it gives us a little relief knowing that we can just listen at home. My children love it too, since they do not get to go to the DR's office for each visit. Thank you so much for such a wonderful opportunity, and some relief that my babies are doing good. God Bless and Happy Holidays!" 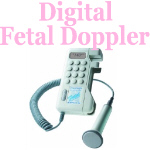 "Thank you so very much for having a company which allows expectant parents to rent these dopplers! We love being able to hear our beautiful baby's heartbeat anytime! We have definately spoiled ourselves and we don"t want to go a day without hearing it!" - Chris & Heather M.
"I am 38 years old and my husband and I never planned on children, but God saw to bless us with this child. I have taken great joy in listening to the strength of my child's heartbeat and love the way it feels to share in the life of my child in the womb. Thank you so much for your service!" "My wife and I would like to thank you for the excellent doppler. It not only let us enjoy the heart beats of our baby but also helped diffuse a lot of anxious moments when we were concerned about the health of the baby inside. I would surely recommend the doppler to all my friends and thank you again for your excellent service and support!" "I just wanted to let you know how awesome it is that I found such an amazing Christian company. I looked up "fetal dopplers" on Epinions.com and saw a review by someone who mentioned that you prayed for each mom and baby. That is just so awesome. I knew I had to order from you. Thank you so much for your service...when I receive my doppler I will be so excited to use it. Thanks again and God bless!" "I just wanted to thank you so much for such a great service. I have greatly enjoyed the comfort the doppler gives. Early on, before I could feel movement, the doppler was so helpful. It has helped me to know that my little girl is healthy and safe. The doppler has also been the best bonding experience for my other two daughters. They enjoy listening to their baby sister's heartbeat, along with her kicks, rolls and hiccups. Thank you so much!!" "I wanted to thank your company for offering such a great product to have within the home. I ordered the home doppler when I was around 8 weeks pregnant and being able to hear the heartbeat whenever I wanted during the first trimester and early second was such a blessing. It made many of my worries go away! In addition, all of my familiy loved being able to hear the heartbeat of our little girl and share in this wonderful experience. Thanks again!" "I just had to write and tell you what a GOD send my doppler is. I am so happy about it and have told everyone. I ordered it around my 10th week LMP, received it within three days and heard my baby's heartbeat right away. Some people told me you can't hear it until it is 12 weeks along. The day I received the doppler I had a big scare. I started bleeding pretty heavily. My doctor told me that he thought I was miscarrying and to come and see him in the morning. Well I listened to the baby's heartbeat all day, literally and it gave me such a piece of mind. I have been bleeding off and on through out this pregnancy and without my doppler I would have absolutely gone crazy with worry and anxiety. I tell ALL of my friends about it and now my sister in law has gotten one too! Thanks to Heartbeats at home I am as sane as sane can be while pregnant! This doppler is a must. I would never do without it! Thanks!" "I finally received my heart doppler and it is amazing! It is exactly what they use at the doctor's office! No more waiting each month to go to the doctor and listen to my baby's heart beat, I can do it at home anytime. It is so comforting to know I can listen to by baby whenever I can now. I am 16 weeks pregnant and this is such a wonderful time for us and I want to thank you for your services." "I would like to thank you so very much. 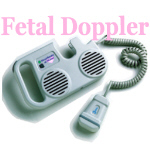 This doppler has been a wonderful source of comfort for her since her pregnancy started out with a concern. I am so happy to tell you that she is now in her seventh month and both she and her baby (boy) are doing great! We are a Christian family and knowing that your company truly cares for the people that you send the doppler to is such a wonderful thing. Again, our many thanks and God bless." "I loved having the doppler, and I felt so much more comfortable being able to hear my baby, since I wan't experiencing much movement. It was great!! You've been a wonderful company to work with, and I will highly recommend you to my friends and family. Thank you,"
"Thanks so much! You seem to have a wonderful company operation with great customer service." "I just wanted to say that I love the fetal doppler!!! I received the doppler a couple of weeks ago and have been able to hear my baby everyday! I am now 12 weeks pregnant but was able to hear my baby at 10 weeks. It is such a wonderful thing to be able to rent something like this. The rental fee is a really great deal. I have a two year old at home and recently had a miscarriage, so hearing this baby's heartbeat has been the greatest sound in the world!!! I want to say thank you for giving moms this opportunity. I will definitely recommend this to all my friends. Thanks again,"
"Hi there, my name is Renee McCarley and i rented my doppler about a week ago. I am LOVING it! My husband and I always listen before bed at night and our 3 yr old son loves to hear what he calls the baby's "beep beep". It has been so nice to have it around. The grandparents have loved listening over the phone too. It's a neat way to share the pregnancy even though we are miles and miles apart. So I just wanted to say thank you and I am loving the doppler! Thanks so much!" "Having your doppler at home has been one of the best experiences in my life. One morning I was having some spotting which scared me, luckily I had the doppler, heard the heartbeat and was reassured that the baby was fine until I arrived at the doctors office. The baby is doing wonderful now and I am over halfway there. I have had the doppler two months and would recommend any Mom to you. My family has really enjoyed getting to hear the baby on a regular basis. Thank you!!!" "I just received my Fetal Doppler today -- and I ran to the bathroom at work to try it out -- wow. I think it's even more amazing doing it myself (as opposed to having a doctor do it) It's incredible, it really makes this whole thing real. After trying for over a year, being on fertility drugs, tons of testing, and lots of prayer -- we were finally pregnant. We went in to see the heartbeat on ultrasound, and it wasn't there -- after 4 (over a month) visits with no heartbeat or fetal development our pregnancy was determined "void." We begged the doctor to save our baby and tearfully he said there was nothing that they could do. We were crushed. The Lord had another miracle in mind -- you know how sometimes he has to put us through a long period of trying to make us see that He can do anything (without our help ;-). Soon after we lost that baby we were pregnant again " miraculously blessed because no fertility drugs were used and the doctors didn't expect it to happen for a while. We are now at 18 weeks -- even though our chances for miscarriage are low I still worry every day that we will loose this one too. I think that being able to listen to the heartbeat whenever I want will really put me at ease -- it all ready has today. I feel amazing. That is the most beautiful sound in the world. Thank You Thank You Thank You -- I can't wait to let my friends and family hear the heartbeat tonight." "I wanted to write and thank you for the wonderful doppler...after experiencing a stillbirth earlier this year I have been so comforted knowing I can check on this baby at any time...I use it once or twice a week just for peace of mind...its great that a company like you can give that to pregnant women! Thanks for all you've done!" "Just sending you a little heads up. We have been very relieved to find this equipment. Our daughter (Kailani) was found to have her umbilical cord wrapped around her neck TWICE, which put us in a position to be constant with our attention to her heart beat and blood flow. If the heart rate would drop, showing sign of a lack of oxygen, we had to go to the hospital, if her heart rate or movements increased, showing sign of struggle, we would have to go into the hospital. Not to mention that her umbilical cord was short and the amniotic fluid seemed to teeter between low and normal no matter how much water and fluids were consumed. Making the situation that much more at risk of her being straggled in the womb. Without the Baby Doppler we would not have had any piece of mind except the times that we would go in for our NS tests, every 3 days!!. The Baby Doppler gave us the ability to monitor Kailani's heart beat and blood flow throughout the remaining 3 weeks, until she was born via C-section to ensure that she would not be strangled by the cord. It was a very tense and serious situation that I hope no parents have to wait through. But your doppler was for sure a blessing that relieved enormous amounts of stress helping mommy to relax and be patient and attentive until birth, in turn helping the whole pregnancy in the time of most need. She was 5lbs 13oz. and 19.5 inches long!!! Thank You and God Bless!" "I've had my doppler for about 2 weeks now and I love it! My husband, daughter, and I listen to our "new baby" a few times a week. Our daughter is 5 years old and very excited to become a big sister. My husband and I have suffered 6 miscarriages since the birth of our daughter, and I cannot tell you the peace of mind it brings to be able to hear my baby's heartbeat. The time between doctor's appointments felt like an eternity before we got the doppler. Thank you for providing a real service to anxious parents, and thank you for your continued prayers. Sincerely,"
"Having the heart monitor has brought much comfort to both of us. When I was feeling uneasy, before I could feel her move, I would come home from work and listen to her. It is the most beautiful sound my ears have ever heard. My doctor"s appointments are great, but we only listened for a few seconds and I had to wait 3 weeks in between. With the home Doppler, we can listen to our daughter any time. When family comes over we all listen. It"s a miracle. Thank you for bringing more joy and peace of mind to our pregnancy. I will definitely recommend your services to future moms." "I just wanted to drop a line and let you know how much I enjoy this Doppler. It is awesome I can listen to my baby anytime I want. 26/mth is such a small price for peace of mind. It is crystal clear. I had no problems picking up junior's heartbeat. And delivery time was very quick. Thanks a million." "Thank you for the use of this wonderful machine. It really helped put me at ease. It was nice to hear my son's heart beating whenever I wanted. It was especially nice on those days when he was overly active. I gave birth to a baby boy on October 2, 2004. He is healthy and beautiful! Thank you! Your machine helped me to be happy and healthy without having to worrying to much!" "Thank you very much for expediting my order quickly. I love to have the doppler and use it every day. I ordered it because I had 2 miscarriages before this pregnancy and with the 4th of July holiday, I needed to have an assurance that this baby is doing OK (until I see the doctor again). I am now almost 15 weeks pregnant and everything seems to be going OK. I think I'll keep the doppler for the rest of my pregnancy. I love it, as well as my husband and my 2 year old son are enjoying listening to the heartbeat of the baby. Thanks again." "Oh my gosh! I just want to cry! Thanks so much for your thoughtfulness and unselfishness! I never dealt with a company and with such special people like yourselves, and it's a true breath of fresh air in our world today. I thank you from the bottom of my heart! You are truly the best! Thanks again! Love,"
"I want to tell you that from the time I clicked on your web link, to the first time I heard my baby's heartbeat, it has been nothing short of a pleasure to have found you and your company. The fact that you are praying for me and my baby had a huge impact on me, knowing that you are Christians and truly have expectant mothers and their babies best interests at heart, or at "Heartbeatsathome.com." Thank you from the bottom of my, and my baby's heart. God bless!!!" "Thank you for all of your help, and it was wonderful doing business with you. We will remember the name Heartbeats at Home, to recommend to others, and shall we have another child, rent from you again. Again, thank you for this opportunity." "I just could not wait to give you an update on how comforting the fetal Doppler has been to both my husband and I. We just received it on the 12th and it has been a huge blessing. After going thru 3 early miscarriages, having the Doppler has encouraged both of us as we progress in our pregnancy - this will be our first child. We have never made it this far and hearing the baby"s heartbeat when fear and worry creep in has filled us with peace. I"ve taken it to my mom"s house and shared the awesome miracle of life with my family. We have all cried with joy." - Lily & Alex T.
"We absolutely loved the doppler & it made our pregnancy even more enjoyable & fun (and it was very reassuring to hear that little heartbeat whenever we wanted to!). What a great idea for expecting parents! Thanks for making it such an easy & fun experience. And thanks for your quick response---so efficient!"